This is the second part of the article about selecting, unboxing, and reviewing a Davis USB data logger (6510USB) and Vantage Pro2 Weather Envoy (6316) (Part one of the review is here). Vantage Vue Wireless ISS (Integrated Sensor Suite) - 6357Vantage Pro2 Weather Envoy - 6316 USB data logger with WeatherLink software - 6510USBIn this part of the review we look at items 2 and 3 of the system Both of these units can work with other sensors, but the ISS wireless sensors met my needs. It also allows me to move the sensor assembly around as I find the perfect location for it. Very happy with the design of the USB logger and the USB extension cable quality. Truth be told I wish I could have bought just the USB datalogger. I really only needed the logger. I decided to take the plunge and buy a Davis Vantage VUE weather station for my house. I wanted a quality unit that I wouldn't have to mess around with that reported reliable results. I also didn't want to pay a fortune for what is really a hobby. I planned this to be the perfect compliment to the McHenry Illinois radar weather that shows on my family website. Our Moen high arc kitchen faucet started to leak around the base of the high spout. 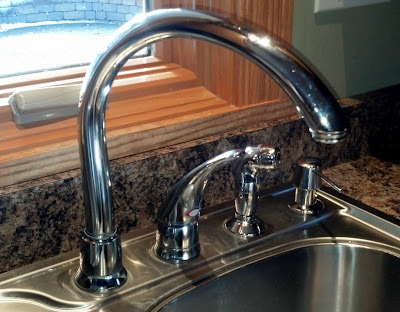 We had the Moen Monticello 7700 series single handle faucet for 8 years and it still looked great, it just developed a leak around the base of the spout. Looking at the Moen Monticello 7700 series faucet instruction manual this kitchen faucet has a lifetime guarantee for homeowners and there is an o-ring (#25 in the parts diagram) that is likely the source of the leak. Use the exploded diagram on page 2 of the manual to get the part numbers in the rest of the article. The high arc faucet would leak around the base for several hours after being shut off. It came from the water that was in the spout assembly after shutting the faucet off.